To Empower, nurture, and strengthen marriages. 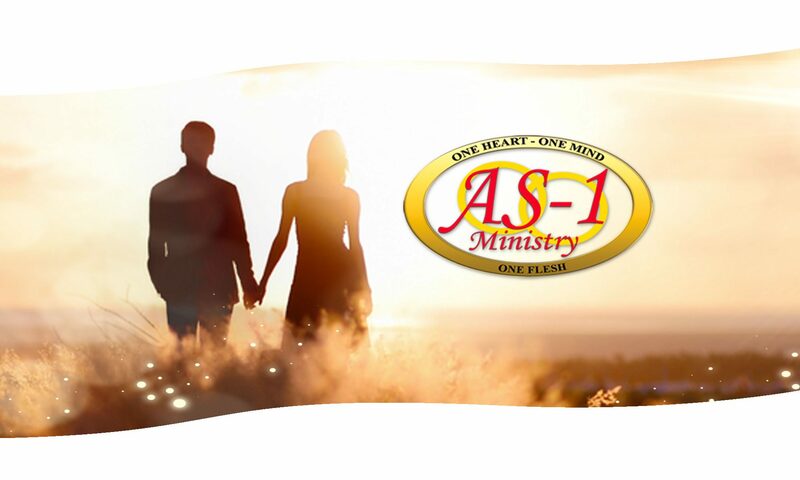 As One Ministry was founded in 2010 by Kyle and Tranette Sanders out of their own need for marital help and a desire to help other married couples. Noticing that many churches didn’t have active or strong marriage ministries, As One Ministry was designed to fill in the gap. Couples from churches all over Los Angeles and Orange Counties, with varying denominations, gather together for one common purpose – to strengthen their marriage. 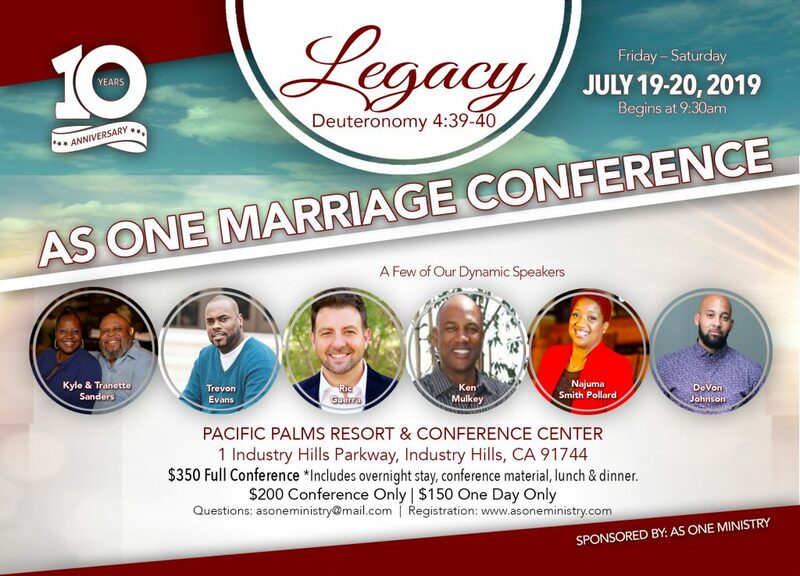 Empowerment, nurturing, and the strengthening of these marriages occur through Bible studies, workshops, fellowships, and the annual As One Marriage Conference. Because marriage is a sacred covenant ordained by God and not to be broken, we have purposed to stand in the gap for marriages by praying; providing tools through monthly meetings, literature, media and annual conferences; and offering spiritual support to help rebuild the broken marriage and strengthen the solid marriage. We believe if couples apply the Word of God individually and together in their marriage, they can truly walk AS ONE in love and as a light to fulfill God’s intent to model marriage after His relationship with His church and help build His kingdom. Marriage and its sanctity is under attack. Divorce is on the rise in and out of the church, couples aren’t walking together as one or experiencing the abundant love and the joy of marriage, and the couples looking for help and resources in a spiritually intimate setting can’t find it or it isn’t readily available in some communities. As One Ministry is on assignment by God to provide an opportunity for married couples to be taught God’s instructions for marriage and encourage them to commit to the covenant they have made with each other and God. Believers in Christ – to remind/inform them of the call of God on their marriage; Non-Believers – to introduce them to Christ and teach them of God’s calling; The Newly Married – to provide mentors to help guide them through their marriage; Engaged Couples – to provide guidance during engagement and prepare them for marriage by of God’s design for their new role as husband and wife. Kyle and Tranette Sanders have been married for 18 years. They have three sons of God, Joshua, Jacob, and Joseph. 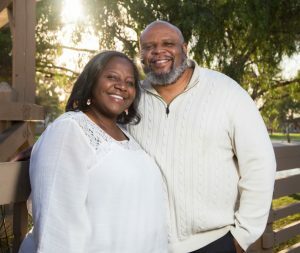 Their home church is The Bridge Buena Park where Kyle serves on the Worship Team and Tranette serves on the First Impressions team. Together they serve as Millennial Leaders and in Marriage ministry while also hosting Life Groups. They are passionate about marriage ministry and also serve united through As One Ministry. As One Ministry is a 501(c)(3).